If you live in Garden Grove, CA and have piles of paper documents and you are in need of paper shredding services, Shred Connect is your solution. We are paper shredding services at their finest and can take paper-filled offices and turn them into less cluttered spaces. File cabinets crammed with outdated and unneeded paper can easily be solved inexpensively and confidentially. Protect yourself, your business, and your clients by choosing to destroy your old paper documents with our secure document shredding. 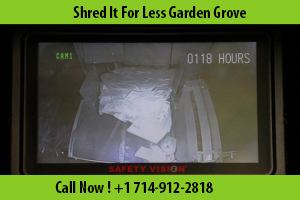 We make document destruction easy and affordable to be organized, eco-friendly, and secure. Shred Connect has a variety of locations throughout Orange County in order to make your paper shredding experience with our locally owned and family operated shredding company as convenient as possible. You may visit any of several drop-off locations in the Garden Grove, CA, area to deposit your paper and request a certified Document of Destruction be mailed to you so you can rest assured that your documents have been completely shredded will never fall into the wrong hands. If you are unable to visit one of these drop-off stations or have large volumes of material which necessitates a different approach, our paper shredding services are more than prepared to accommodate you. We are happy to come to your home or business and will remove your boxes of shredding material to our mobile shredding unit at the curb. No amount of paper will deter us or slow us down. Our removal is always prompt and efficient, so as not to disrupt your office or home for more than a few minutes. As a shredding company, we handle tons of paper. Because we handle SO much paper waste we can either have an enormous, detrimental impact on our local landfills and environment or a positive one. Much like other shredding companies we opt for the latter by encouraging our clients to shred anything which has personal or business information anywhere in or on it. This accounts for much more than most people initially realize. The credit card applications, the financial records, the letters, the old tax returns, the invoices and receipts, the doctor appointments cards, etc. can all shed light on your behaviors, your family, your financial information which you do not want shared for any of dozens of reasons. When we are entrusted with your sensitive documents, we shred them immediately, often right as you watch and then we promptly recycle the tiny pieces so they can be given new life and save hundreds of thousands of trees. There is no need to worry about someone being able to piece the tiny bits of paper together to reveal confidential information. Even if there was a slight possibility that this could happen, the shredded paper is not left lying about unguarded but quickly disposed of properly. 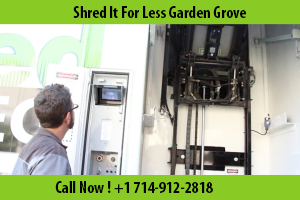 Shred Connect is a document destruction company with integrity and we are proud to service the Garden Grove area. Contact Shred Connect today for paper shredding services near you!